Back in the early '90s, I looked with dismay on my fellow Renaissance Faire participants and Civil War re-enactors inventing card and dice games because they lacked the energy or research skills to find the rules to actual, historical games. 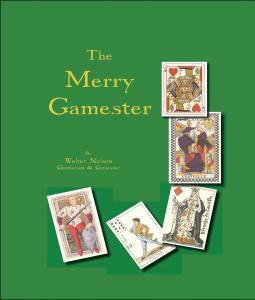 To address this, I wrote and self-published "The Merry Gamester: A Practical Guide to the English Speaking World's Most Popular Card Games, Dice Games and Divers Amusements from Ancient TImes to 1900". I sold this book directly, or through vendors like "James Townsend & Son", for almost ten years, selling somewhere around three thousand copies. Unfortunately, a few years ago, the printer who was giving me a sweet deal went out of business, the price of postage went up and my office stopped providing a "mail it from work" service for packages. When this all happened, it became too expensive and too much trouble to continue to sell the Gamester, so it officially went "Out of Print". Now that it has been out of print long enough that the inventory at my vendors has been exhausted, I think the time has come to start giving it away for free. Note that I do retain copyright on this item. It is free for all personal and educational use. It is not provided for the purpose of resale. Please, if you extract from it, give it a proper reference. Submitted by Unregistered on Tue, 07/26/2011 - 11:39am. Thank you so much for providing this! I'm a historical novelist and the hero in my next book loves card games.